Pre-workoutOlimp Endugen - 60 kaps. Endugen - Thorough analysis of physical effort, to which are subjected to people practicing both professionally and amateur sports endurance, we note that it is running a large characteristic change, where activities such as dynamic starts, quick changes of direction, sudden braking and acceleration, and well once overcoming longer distances at different speeds, extremely smoothly intertwined, building a globally high-intensity effort. In such conditions, anaerobic mechanisms of energy production are supplemented by oxygen metabolism, which, overall, are the dominant source of energy produced by the body for the purpose of realized effort. For this reason, well composed supplementation should include the use of high-quality preparations for endurance athletes, allowing maintain the high efficiency of aerobic and anaerobic energy production. Its components are collected in a synergistically active groups that: form a permanent conditions of the intracellular environment and support mechanisms to prevent the pH reduction as a result of the effort generated during large quantities of lactic acid. The acidic proton ions may in fact, reduce the formation of ATP and its transport to the vicinity of contractile fibrils, thereby impair the efficiency of the anaerobic mechanism of energy production. 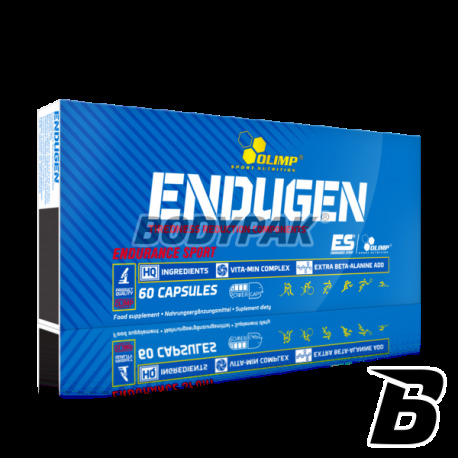 Operation in the maintenance of the pH-change and the whole cells of the organism will show contained in ENDUGEN ™ beta-alanine, sodium bicarbonate and potassium salt of phosphoric acid, which may contribute to an increase of strain using it athletes. Positive effect on the energy production mechanisms of oxygen which are based on the use of free fatty acids from body fat stores. Studies show that a greater capacity for aerobic exercise may occur following the use of L-arginine (in ENDUGEN ™ in the form of alpha-L-arginine), or extract of Korean ginseng. Supporting effect on strength during exercise can also be pure capsaicin and caffeine, as well as the sustained release profile derived from an extract of guarana. They support the work of the nervous system, allowing you to maintain the high conduction velocity signal, while rejecting the time of occurrence of fatigue. Research proves that such action is taurine, which is also found in the composition ENDUGEN ™. Synergistically their action coupling with other components acting in this direction, ie. Magnesium (in the form Albion® amino acid chelate), vitamin B2, niacin, vitamin B6 and B12. 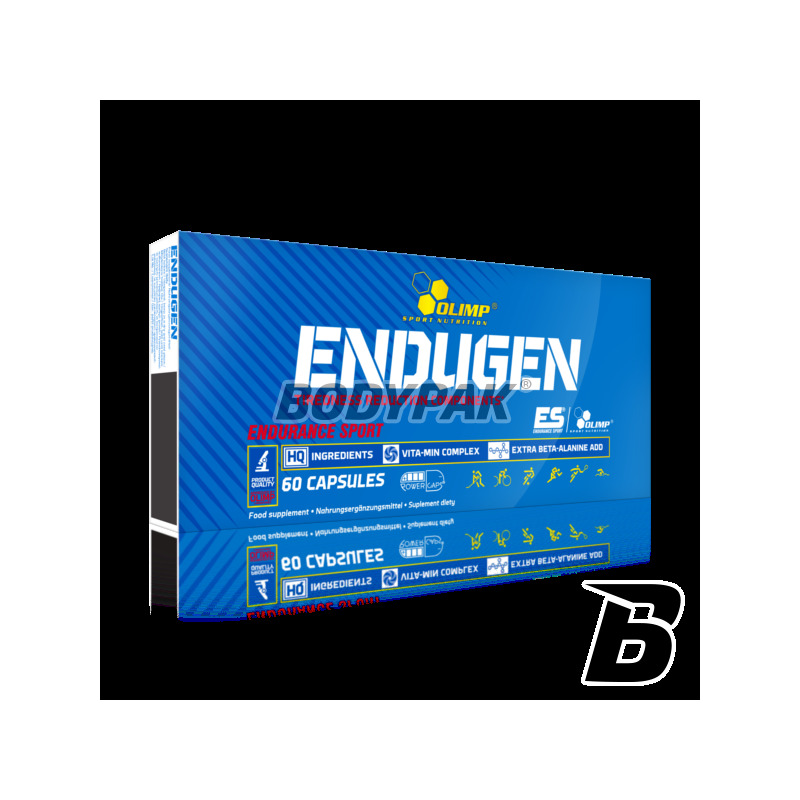 ENDUGEN ™, composition of carefully selected plant extracts, supplemented with a powerful dose of beta-alanine, and sodium bicarbonate, or components for many years used in elite products to increase strength and aerobic capacity (VO2max), designed for the most demanding athletes, especially athletes endurance athletes where high physical capacity determines victory. 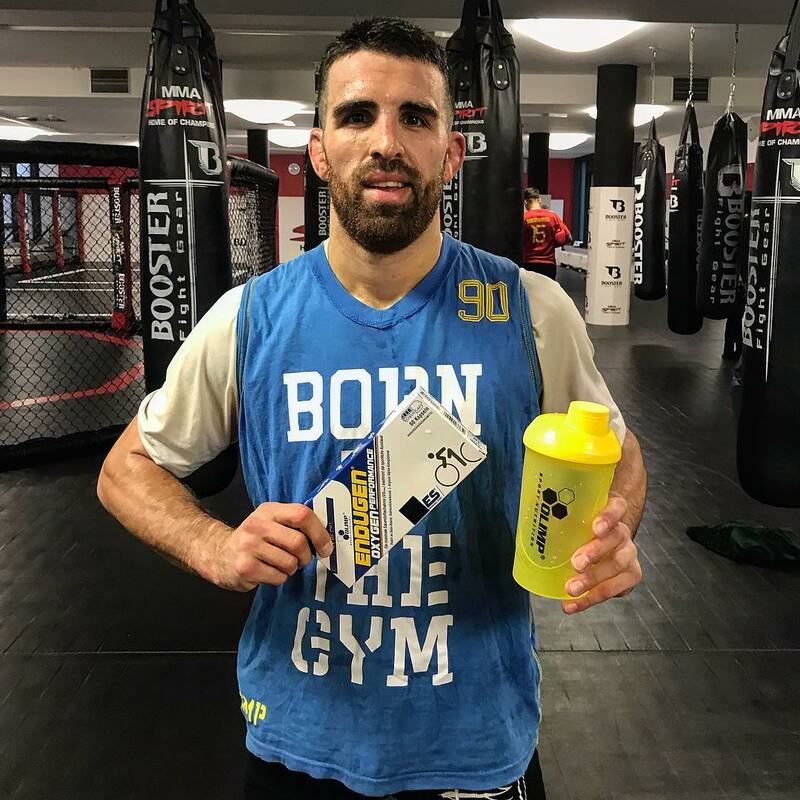 The product is intended for use prior to and during the most grueling sporting events, as well as in the period of intense exercise (grouping of personnel, training camps, training). SKŁADNIKI: 34,4% beta-alanina, 20,3% diwęglan sodu, sole potasowe kwasu ortofosforowego, alfa-ketoglutaran L-argininy, substancja wypełniająca: celuloza mikrokrystaliczna; tlenek magnezu, tauryna, 3,1% ekstrakt z korzenia żeń-szenia koreańskiego ( Panax ginseng C.A. Meyer), substancje przeciwzbrylające: dwutlenek krzemu, sole magnezowe kwasów tłuszczowych; kofeina bezwodna, 1,1% ekstrakt z nasion guarany ( Paullinia cupana Kunth. ), diglicynian magnezu (chelat aminokwasowu magnezu Albion®), amid kwasu nikotynowego (niacyna), ekstrakt z owoców pieprzu kajeńskiego (Capsicum annunum var. longum Sendtn. ), cyjanokobalamina (wit. B12), chlorowodorek pirydoksyny (wit. B6), ryboflawina (wit. B2), kapsułka (składniki otoczki - żelatyna, barwnik: E171). Biorę ten środek do biegania i polecam gorąco. Zwiększa wydolność na treningu. Zdecydowanie lepsza wydolność w trakcie treningu wytrzymałościowego. Cena jest bardzo zachęcająca. Od siebie zdecydowanie polecam!